Denmark is a part of Scandinavia and a member of the European Union. The total area is 43,000 sq. kilometers (not including the Faeroe Islands and Greenland). The population is around 5.6 million of which 85% live in the cities and towns. About one third of the population lives in the capital area of Greater Copenhagen. Denmark is a low-lying country, its highest point rising 175 meters above the sea. Approximately 10% of the country is used for urban areas and transport installations, 67% is agricultural land, 12% is forests, and the rest is semi-natural areas such as heaths, lakes and streams. Denmark consists of Jutland, a peninsula, two major islands Zealand and Funen, and an archipelago of around 400 islands of which around 80 are inhabited. The total coastline stretches for some 7,300 kilometers. Denmark has a long history as an independent kingdom. Since the end of the Viking period around the year 1050 the territory of Denmark has been governed by Danish kings and queens. A strong cultural identity has been developed throughout the years. Denmark is a constitutional monarchy governed by a representative democracy organized in three levels: at the national level there is parliament with legislative power and ministries responsible for certain fields; at the regional level there are 5 country councils responsible for different regional matters such health, special education and regional development; at the local level there are 98 municipal councils responsible for all local public functions. The first cadastre was implemented along with the absolute monarchy in 1660. Before that time the nobility administered individual books of the land taxes paid by the farmers to the lord of the manor. The newly formed government established a nationwide cadastre in 1664, the so called Matrikul of 1664. This cadastre was used as a source for the tax collection until 1688, where a new cadastre was taken into use. In the new cadastre land parcels were measured, so taxation could be based on area sizes as well as soil conditions. However, the current cadastre is younger. It derives from the results of the enclosure movement in the end of the 17th century, and was established in the year 1844. 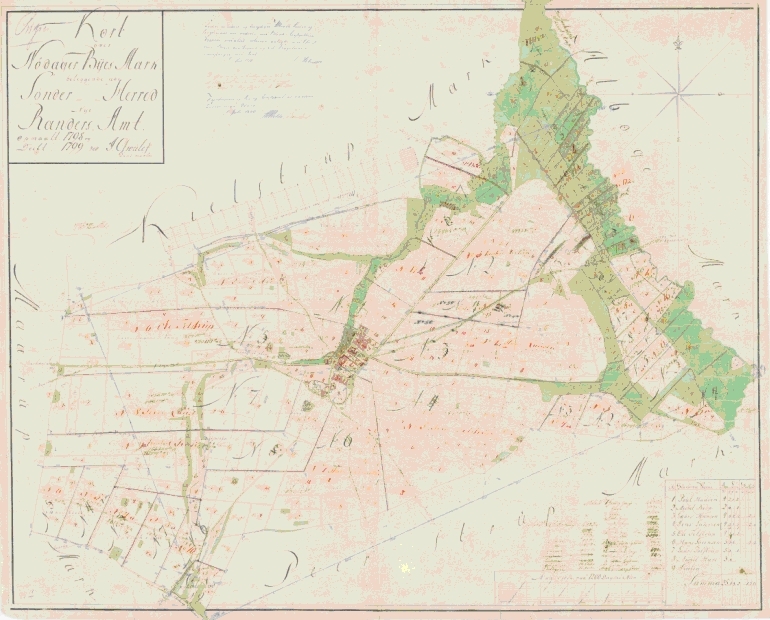 From the very start, this cadastre consisted of two parts: The cadastral register and the cadastral maps. Both of these components have been updated continually ever since. Over time the Danish cadastre has changed from being primarily a basis for land valuation to a legal cadastre supporting an efficient land market. The Danish Geodata Agency under the Ministry of Energy, Utilities and Climate is responsible for geodetic and small-scale topographic mapping, nautical charting, and for maintaining and updating the cadastral register and the cadastral maps. Legal rights to land such as ownership, mortgage, easements and leases are recorded in the centralized electronic Land Book under the authority of the Ministry of Justice. The Land Book is based on the cadastral identification of the land parcels. In Denmark, activities regarding property formation, also known as cadastral activities, are divided between private licensed land surveyors, and the cadastral authority of the Danish Geodata Agency located in Aalborg. For more than 200 years, these activities have been carried out in a “Public-Private Collaboration Model”. The private surveyors perform cadastral work, which involves demarcation and survey of the plot as well as preparation of the documents necessary to register the changes in the Cadastre. The cadastral authority ensures compliance with the provisions of the Subdivision Act and other legislation before the changes are registered in the Cadastre. Next to cadastral work the private surveying firms carry out engineering surveys and mapping tasks, and offers consultancy on legal and managerial issues concerning land use and property rights. In 2009 there are 80 firms of licensed land surveyors in Denmark with about 150 branches. There are about 200 owners and about 150 assistant land surveyors with or without authorization. Furthermore around 200 employees with technical or administrative qualifications are employed in the sector. The number of surveying firms is decreasing and the structure of the private surveying branch is changing over time. The trend is towards bigger firms and company co-operations. The surveying profession in Denmark is organized under The Danish Association of Chartered Surveyors (DdL). There are about 1300 active surveyors in Denmark (as per April 2010) out of which about one third is engaged in the private surveying firms. The total number of surveyors is about 1450 included pensioned members, student members, etc. Cadastral work, or surveying for legal purposes, in Denmark is a monopoly of licensed surveyors in private practice. The Minister of the Environment grants the license to surveyors after having completed a five-year University degree of M.Sc. in Surveying, Planning and Land Management, and having worked for a private surveying firm for three years. There is no further examination to be passed. Surveyors can only obtain their education after having completed a five-year university degree of M.Sc. in Surveying, Planning and Land Management at Aalborg University. The curriculum consists of three years of general studies and examinations in the main fields of surveying and mapping, GIS, cadastre and land-use management, and spatial planning followed by two years of specialized studies. During the last two years of studies the students have the opportunity of specializing in certain fields of the surveying profession, such as land management, GIS and measurement science. The students also have the opportunity to undertake half a year of traineeship. The final half-year term takes form of a final project for the dissertation thesis. About 20-25 students graduate each year. A preferable amount would be around 50 students. Over time the Danish cadastre has changed from being primarily a basis for land valuation and taxation to becoming a legal cadastre supporting a land market. Today the cadastre has an even broader objective, and it is accepted that when cadastral information is a part of integrated land information systems it can improve the efficiency of the land transfer processes and overall land management processes as well as act as a underlying property reference layer in other sectors such as the planning and environmental. In short, the Danish cadastral system has met the challenge of adapting to the modern digital GIS-environment. There is only one type of cadastre covering the total territory of Denmark. However, one may argue that the strata titles have a separate status since they appear only in the Land Book as a horizontal subdivision of the buildings on a property (land parcel) that is identified in the cadastre. The term "property" is a legal term defined in the Subdivision Act to include one or more land parcels as determined in the cadastral register. These properties are used as a basis for securing legal rights such as ownership and mortgage – rights that must include the total property. A land parcel being a part of a property may hence only be sold or mortgaged separately when first divided from the real property through a subdivision process. Normally, however, a property consists of one parcel only. Buildings are part of the property. The property concept is also used to control the use of land e.g. through the Agricultural Holdings Act, the Building Act, the Planning Act, etc. If a part of a property is adversely occupied for a continuous period of 20 years a person may apply for adverse possession. The title can then be changed to reflect what is on the ground. This issue is dealt with by the licensed surveyors through the process of boundary determination. An archive of the legal survey measurements (about one million sheets) and the old analogue cadastral maps (about 15,000 sheets). The cadastre is updated daily. The cadastral register, the cadastral maps and most of the archive are computerized today and available on the internet. The Land Book records legal rights in land such as ownership, mortgage and easements. The Land Book is based on the cadastral identification (the unique cadastral number) of the land parcels and properties. However, the cadastral maps and the legal survey measurements are hold at the Danish Geodata Agency and are not used in the Land Registry office. The Land Book is available on-line and the lodgment process is fully digital. In Denmark, all registers of property data have been computerized. The registers are formed into a network of subsystems to accommodate the use of digital mapping and to facilitate land use management. The cadastral map is a key component of the Danish national cadastre. It illustrates all property boundary data from across Denmark. It also provides information about protected forests, polluted areas, coastal erosion areas and cliff protection. The map does not contain topological features such as elevation or buildings. The cadastral map is a digital legal document. It is intended to present the cadastral register in visual form, such that individual parcels can be identified along with their attribute data (cadastral number, road access, etc.). 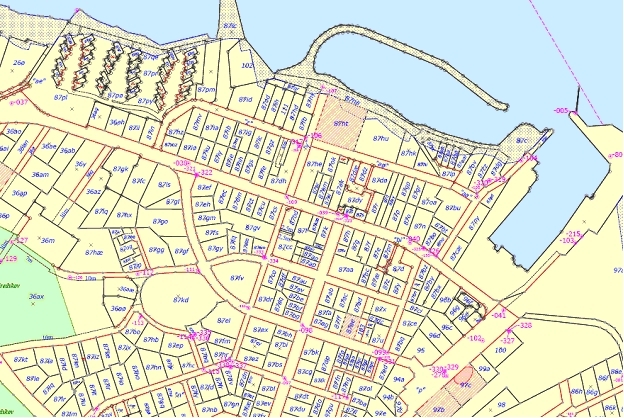 The cadastral map is updated daily, as new property registrations, boundary changes and field surveys are submitted to the Danish Geodata Agency for approval. This excludes the environmental data found in the maps (protected forests, polluted areas, etc. ), which are generated by the responsible public agencies, but updated by the Danish Geodata Agency. Today’s cadastral map is based on historical, hand-drawn property maps that through the years 1991-1997 were digitised (vectors) and georeferenced in a national grid. The today used digital map is essentially a controlled digitization of the old analogue “island maps” covering the individual village areas surveyed by plane table at a scale of 1:4000. The map is established in a two-stage process: Firstly, state control points and cadastral surveys connected to the national grid form a "skeleton" digital map. In urban areas about 40 % of the boundary points are entered this way and in rural areas about 20 %. Secondly, the remaining areas were inserted into the skeleton map by transformation often using the digital topographic map as control. In 2008 all data were transformed to UTM Zone 32, EUREF89. In-field surveys and measurements are increasingly improving the precision of the digital cadastral map. However, since the existing map is based on analogue maps, the accuracy of the cadastral map varies from a few centimetres in some urban areas to several metres in some rural areas. Therefore, the digital cadastral may not totally compare to a digital topographic map. It must also be noted that the digital cadastral map is a graphic map, not a numeric map. This means, that the co-ordinates for the boundary points only represent the boundary in the graphic map. The final determination of boundaries must be done according to the cadastral regulations. The parcel co-ordinates in the cadastral database therefore may not be used for exact calculation of parcel areas and dimensions. The procedures for updating the digital cadastral map will be just opposite to the procedure for updating the analogue map. In the analogue map new boundaries were adjusted graphically to the position of existing mapped boundaries. In the digital cadastral map any new cadastral measurement will be used for adjusting the position of the existing boundaries. This establishes a process of continual improvement of the accuracy of the cadastral map - a dynamic element. It is however recognised that some problems may arise in practice when a decision has to be made on the area to be included in the adjustment. Furthermore, adjustment of existing boundaries in the cadastral map may cause problems in those cases where other administrative boundaries or features were based on cadastral boundaries in a Geographical Information System. These problems of upgrading the cadastral map will continue to be investigated so that sustainable solutions can be developed to suit all users. The map is linked into the national grid network and is showing only the current cadastral situation. Boundary points shown by circles are established in the map using control points and the legal survey measurements. The digital cadastral database (DCDB) also includes metadata to explain about the nature and origin of the features. The digital cadastral map, this way, is tailored for integrated land management. Figure 2: The Danish cadastral map. It is recognized that the Danish cadastre provides a basic infrastructure for managing economic interests in land as well as supporting environmental and development interests. The interaction between the cadastre and the Land Book operates very efficiently even though the two systems are maintained in different organizations. The Danish concept for integrated land management is organized as a network of interactive subsystems containing the information that are used very often. The automatic linkage between the subsystems is achieved by establishing the "Cross Reference " (part of the Building and Dwelling Register) which contains all key identifications within each subsystem (e.g. the parcel number, the building number, the address, etc.) and the cross reference between these identifications. This means that it is possible to obtain all available information on a specific parcel, property or building by knowing only one of the keys. Furthermore, the identification-keys are linked into the relevant physical element represented in the digital maps such as the parcel, the building, etc. The importance of the cadastre layer to support land management in general has steadily increased. Today the layer has become an important component for managing a number of environmental acts as well as planning processes such as town and country planning processes, construction planning and implementation, and utility administration. Local authorities use the cadastre map as the basic layer in the municipal structure planning. This digital process provides a number of opportunities. The land-use regulations are easily identified on the relevant properties with links to the addresses and the name of the owners. The detailed regulations such as zoning and building restrictions can be identified on the relevant properties and located according to the property boundaries. This facility is also used when presenting the planning regulations on the Internet. The citizens can then achieve any relevant planning information just by asking for the specific property. In conclusion, the cadastral system is serving not only the process of cadastral management and security of land rights. It is also providing a multi-purpose use and facilitates a global approach to land management through an efficient interaction between the areas of land tenure, land value, and land use. The information in these areas is increasingly available for the mass market through Web-based information systems. In 2008 a new up-to-date cadastral updating and quality system (miniMAKS), which was implemented. The system increased efficiency and improved standardised digital exchange of data, partly through use of MIA data (Interactive Graphic Software for Creating Cadastral Alterations), and partly by developing a general method to register and maintain items (statutory notes) in the Cadastre. The system has the cadastral register and cadastral map in a common database so that the register and the map are updated simultaneously. Electronic filing of the digital cadastral cases has been introduced in the new system as well as requirements on digital signatures for licensed land surveyors. One of the main focus areas for the Danish Geodata Agency is to gain access to the cadastral data. A focus which will be further developed in the coming years. Today cadastral data are distributed by the Agency for Data Supply and Efficiency Map Supply. The Map Supply provides a range of information services based on WMS and WFS. There continues to be a growing demand on the Digital Map Supply, coming partly from a large number of requests from the Danish Nature and Environment Portal, where the Digital Map Supply supplies the maps of environmental data for public administration and the public in general. Different other professional users also prescribe to the Map Supply. Most users include the provided web map services in their own systems. A special user group consists of ‘partners’ that develop applications, for specific use based on the web map services provides by the Map Supply combined with other data. Access to the Map Supply is limited by username and password. The cost is derived based on actual use of the services. Since January 2009 a special agreement has been in effect for all state departments, which gives access to all data at the Map Supply. Rather than paying traditional usage fees, each ministry will pay a ﬁxed annual contribution based on its use and needs.The yearly contribution is paid via the State financial budget and based on stipulated user profile (type and amount of data requirements). A similar agreement has been reached with the Local Authorities in Denmark from April 2010. The agreement underlines the Danish Geodata Agency's role as a central government’s infrastructure organisation for maps and geodata.